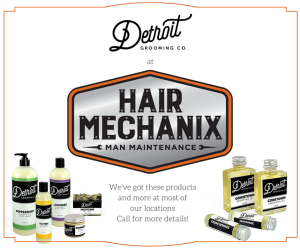 Detroit Grooming Company has entered Hair Mechanix Locations! We are excited to announce that we are now a Detroit Grooming Company retailer and carrying their products at most of our Hair Mechanix locations in Michigan. As we continuously get this brand at each location we are hearing great reviews! Call your nearest Hair Mechanix Male Maintenance location to see if they are stocked with Detroit Grooming Co. salon products. We love their company because just like us its design specifically for men and their hair care needs. With the focus to cater to men and their specific hair types and needs we are providing a place for men to go to to get their haircut, shave, shampoo, head massage, male waxing and more. Now we are carrying this amazing Detroit Michigan based male brand that does just the same! Support your local Detroit Michigan Small businesses! Hair Mechanix and Detroit Grooming Company, stop in for a haircut at any of our locations and check out their products, it’s a two for one! All while we make you look fresh with any of our services and you support local small businesses at the same time!